My research into Isabella Macdonald for the last post renewed my flagging interest in working through the patterns in Miss Lambert’s My Knitting Book (First Edition, 1843). 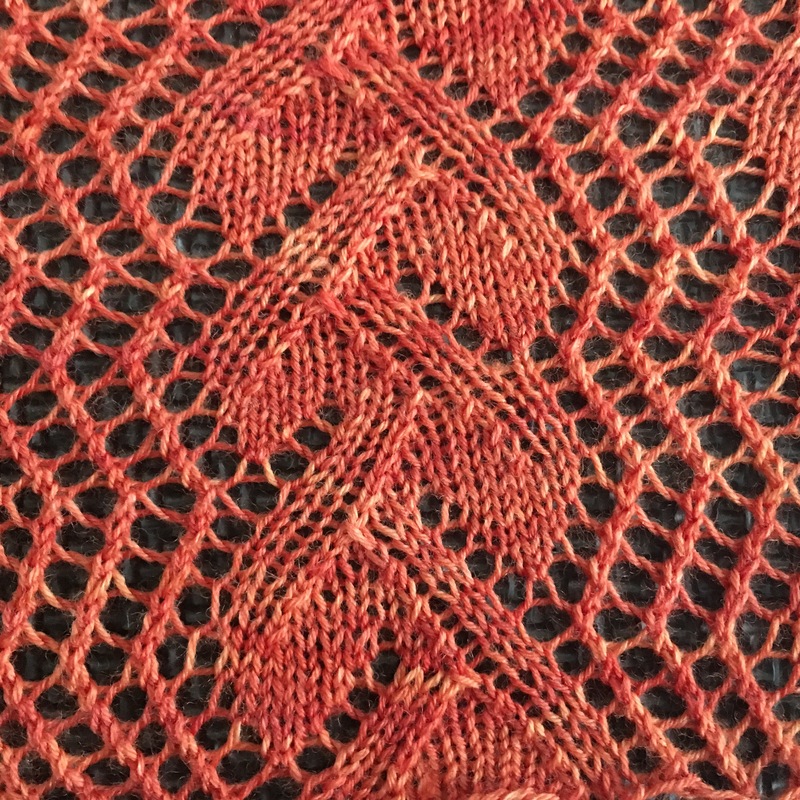 So, after a long hiatus, I picked up my sample for the twenty-fifth pattern in the book: Leaf and Trellis. I am somewhat ashamed to say that my initial post about this stitch pattern was back in early November 2016, before I went on my mission to get organised and take on my WIP/UFO pile. My focus was distracted by exams, Christmas and some serious struggles with our special needs child. I think that partly, I find that lace patterns can be a little onerous to work with when written out instead of charting, especially when life is stressful and easy knitting is all I want to work on. My attempts to chart this stitch pattern from the written pattern didn’t work out at all! Although now that it is knit up, it should be easier to translate into chart form. Regardless, last weekend, I picked up my sample, frogged it back most of the way and then whipped up this sample fairly quickly. This stitch pattern is beautiful, and I love it! The only thing I would change is the method used for decreasing (ssk instead of k2tog) in places where it would make a smoother and more defined leave shape. I have seen this stitch pattern or similar ones in more modern day patterns including Large Rectangle in Leave and Trellis Pattern With Trellis Border (Jane Sowerby) and Vines on a Trellis (Meredith Kermicle). It makes my heart sing to think of women in the 1700s working up this pattern that is still around today. I am thankful for Miss Lambert, Barbara Walker, and all the people in between that have kept this lovely stitch pattern alive for over 300 years. Do you know anyone who enjoys history, historical knitting or knitting in general? Please share this blog post! What a lovely stitch! Will you be ‘releasing’ a chart? Was it fun doing the reverse engineering? I haven’t done it yet but will share when I do!